Captain Critters Country Campground is located between Mitchell and Scottsbluff, Nebraska on U.S. Highway 26 and County Road 18. Drive 3.1 miles west of the Scottsbluff Walmart, or approximately 4.5 miles east of Mitchell, Nebraska. CAUTION! If you enter the street address into your GPS system, you may end up at a cemetery which is DEFINITELY the wrong place! (You may be looking forward to a nice rest, but hopefully not a permanent one yet.) 😮 Continue another mile west and we’re on your right hand side. 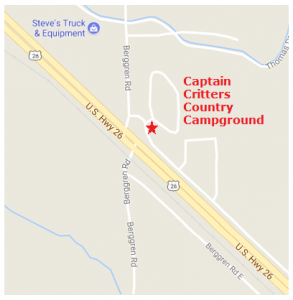 We are located on the north side of U.S. Highway 26, next to Steve’s Truck & Equipment.